Is Plus White Effective? | Does It Really Whiten Teeth? Does Plus White Really Work? 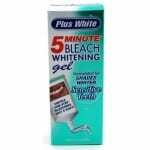 Plus White is one of the most economical, do-it-yourself teeth whitening kits available on the market today. But just because it may be the right price, doesn’t mean it works. Sometimes products become bestsellers by hype and clever marketing. But is this the case here? To use, you can either buy the tube, which contains a peroxide based gel and which comes with a reusable mouth-tray. Or, you could get the two-step system, which comes in a box-kit and includes a tartar control pre-whitening rinse in addition to the gel and tray. This, of course, costs more than buying just the tube. The verdict is still out on how much the rinse actually helps. Most users are quite happy to just get the gel. The kit claims, in bold on the box, to be a five minute speed whitening system. What this really means, when you read the instructions, is that you need to put the gel on your teeth for five minutes, twice a day, for two weeks to get the desired result. Not quite the five minutes promised. However, Plus White, with its all-it-takes-is-five-minutes publicity, has succeeded in creating a good selling product. Most people who’ve used it swear by it and recommend it freely. The teeth do look brighter and everyday stains start to fade with regular use of the gel. One of the reasons for such satisfaction with Plus White, apart from the fact that the product seems to deliver on its promise, is the cost factor. It’s not exactly as effective as going to a dentist, but given the money you spend on it, it’s a pretty cheap and easy way to get cleaner and whiter teeth. You can buy just the tube for $5, and if you want to get the two-step one you’d spend about $11 (or less at Kmart). This makes it a pretty attractive bet for whiter teeth. But, like any other DIY product, Plus White needs some getting used to, and also a little tweaking depending on the user. Also, it’s not as hassle-free as it appears to be. Many users found it messy to spread the gel in the tray and put it in the mouth. The fact that the tray comes only in one size was also a big drawback, as this caused the tray to be ill-fitting in the mouth. Some people recommended getting a well-fitting mouth guard from a local pharmacy and using that for better results. Then there were those with sensitive teeth, who could not take the stinging sensation on their gums. This kind of mild burning is true of most whitening products and Plus White does say on the box to try and avoid getting it on the gums. But, because this is a gel based product, this is a little hard to do. The thing to do, and this comes with experience after having used it a few times, is to put very little gel on the guard so it does not spill out when you insert it. That said, in most cases people found that the gel did touch the gum at times and caused some stinging. Another thing that you need to know is that if gel seems watery, then you either need to shake the tube and if that does not work, then you need to return it, because it’s not supposed to be runny at all. All in all, Plus White largely works. However, it takes much more time than they claim it does. You need to put it on for much longer than five minutes for it to work. More like twenty minutes. Also, it does not work well on really bad stains, but only on light ones. Some users recommended mixing the gel with regular toothpaste and brushing for better results. Plus White works in most cases, so it’s definitely worth a shot. The conclusion is that if you have really yellow and badly stained teeth, this is probably not for you. You need a dentist. Maybe this could be a good follow-up after that, so your teeth remain white. Peroxide would ensure that. But, if you have some moderate staining and yellowness, then this is worth a try. You need to have patience though, and if it does not work at first, try keeping it on longer. What do you think? Does Plus White work or not? Does Go Smile Really Work? Does Supersmile Whitening Really Work? Does the Finishing Touch Smile Pen Really Work? Yeah I noticed the same thing. It happens in some climates and in some homes depending on how long you’ve had it and other factors that break down the chemical composition of the product. However as far as how well it works; I bought it because I drink a lot of coffee all day and I am in the face of clients on call here and there. I am always afraid to get caught out with coffee stained teeth. It is a bit messy for my taste and is a bit long to work as others have stated here. Not that I don’t have tie in the morning I work from home, but I feel as if the whitening strips you put on and sit there with them while you work are much better. Kudos to people who like Plus White! I bought the product with high hopes of having whiter teeth, but just couldn’t handle the process. My gums are very sensitive and the gel was worse than dealing with bee stings! I couldn’t wait for the 5 minutes to be over with! I did try Plus White three times and discovered that on one tooth I had discoloration. It was white, but one spot was looking brown! My dentist said that I always had some discoloration in that particular tooth and that the whitener wouldn’t work on that spot. So now I’m back to my natural off-white color. I’m sure the product works great for a lot of people, but if you have sensitive gums it can be a challenge. I’d heard about this product not working well on teeth that were naturally discolored. It’s worked well for both my wife and I and for the price I certainly do recommend it to others who are looking for an affordable solution to whiten teeth. I’d like to know if your dentist recommended any alternatives (non-whitening solutions)? I too had to get used to the gel but after a few times I was able to handle it and have since not had too much discomfort with the feeling. I did think it took a little longer to whiten than their claim says, but all in all I think it’s a pretty good product. So, as a smoker and compulsive coffee drinker, I’m always on the look out for a tooth whitener. Now, like most gels out there on the market, plus-white works okay. It all comes down to a couple of factors, namely, how dirty are your teeth, and how sensitive are your gums. I’ve had to have my teeth professionally cleaned before, and for anyone who has had this done, they will know that it is a slightly painful and fairly involved process. Powerful instruments are used by a professional who is trained to use them. My point is that any of the gels out there, including plus-white, can only do so much. It does NOT work. Followed directions to the letter. Tried 15 minutes per day for the 14 days and my teeth are as yellow as before. Save your money and time and try something that works. This does not. However they do have clever websites that appear to be from impartial reviewers. What a bunch of phonies. You SOB’s. Moderation is as rotten as your product. I just called CCA Industries, Inc. @ 1-800-595-6230. Use this stuff twice a week, probably 5 -7 minutes each time, for several years. It works. My teeth are definitely whiter. Not perfectly white but considerably better than they used to be. Daily coffee drinker too. I really like it. Now I’m having a hard time finding it in stores for some reason. Hope they continue making this. Using this system on my teeth made them whiter than before. Not white like a movie star’s teeth are, but definitely whiter than they were before. I hope it lasts.